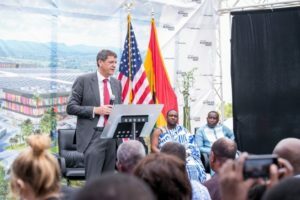 Appolonia Business Park has broken ground on its 70-acre site, welcoming leading Ghanaian and international companies to the light industrial area of Appolonia City, the mixed-use, mixed income development near Accra. Inaugurated by U.S. Ambassador Robert Jackson and Minister of Trade and Industry, Dr. Ekwow Spio-Garbrah, represented by Frederick Alipui, Policy Advisor to the Minister, the event was also attended by representatives of European embassies in Ghana, as well as the Accra business community. Appolonia City Business Park’s fully serviced plots include water, sewerage, storm drainage and a dedicated substation for electricity, in close proximity to residential and recreational facilities in the wider Appolonia City project. The business park is designed to accommodate a range of uses, from manufacturing and processing to storage and logistics. Appolonia City will be home to more than 88,000 residents and 30,000 day visitors, creating tens of thousands of jobs during the lifetime of the project.